One of the worst kept secrets in the modern world is that almost no young people 'buy' music anymore, at least in the traditional sense. They either stream it through the likes of Spotify (or Groove, though this is less likely) or just play tracks, as needed, via the official music videos on YouTube - the latter is completely free, though rather inefficient if all that's required is the audio. But, given the latter, why not craft an application to direct the same audio stream into a local music file on the phone? Welcome to YouTunes! - it's beta-ish, but does work on the whole. Of course, 'ripping' YouTube content in this way is most certainly against YouTube's terms of service, though given the number of YouTube downloader extensions for desktop browsers, none of which seem to get stomped on by Google, I'm not sure that it's seen as that heinous a sin. Admittedly YouTube downloaders get taken down in Google's own Android Play Store, but then that's its own platform - iOS YouTube utilities tend to last longer - and I doubt Google is paying much attention to Windows 10 (despite the previously stated large potential installed base). In this case, the advantage is that you get a local music track for free (other than bandwidth), the disadvantages are that there's a degree of time, trial and error involved, along with manual massaging of ID3 track meta data. Rinse and repeat for each song in an album and it's usually better to just buy the thing from a proper music service (or, in my case, the CD, and have it for posterity - I'm old school). But for quick and dirty one-off tracks ("I really need to listen to that now!") then why not go down this YouTube download route. 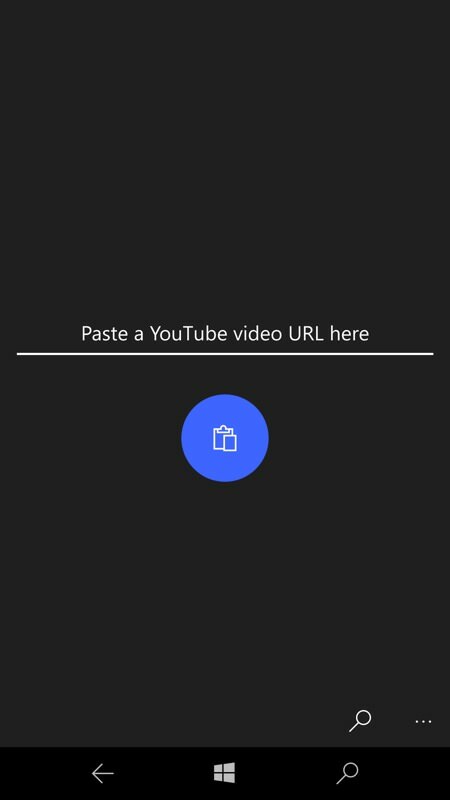 A barebones home UI, you can paste in a URL as shown - but more usually, you'll tap the search control, to be taken into a custom YouTube web view. Note the download control at the bottom! 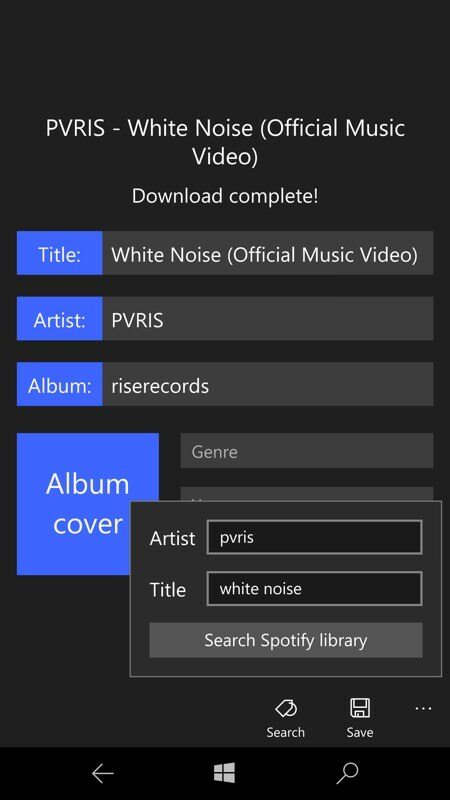 So, with those caveats in place it's time to turn our attention to new UWP app YouTunes!, whose sole purpose in life is to provide a YouTube browsing environment in which there's a 'Download' (audio) control. 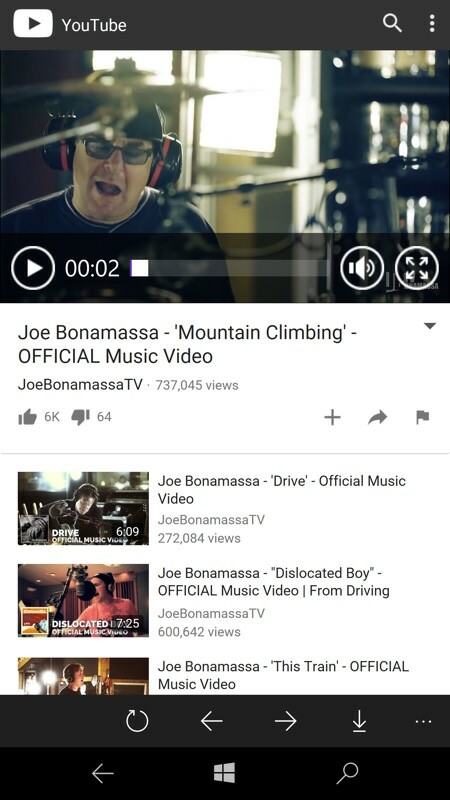 Find the track you want, tap on the control and wait... quite a while, usually, around a minute or so per song - this seems to be a limitation YouTube's end, but then as far as YouTube knows you want to listen to the song in real time, so it won't be optimised for high data rates. 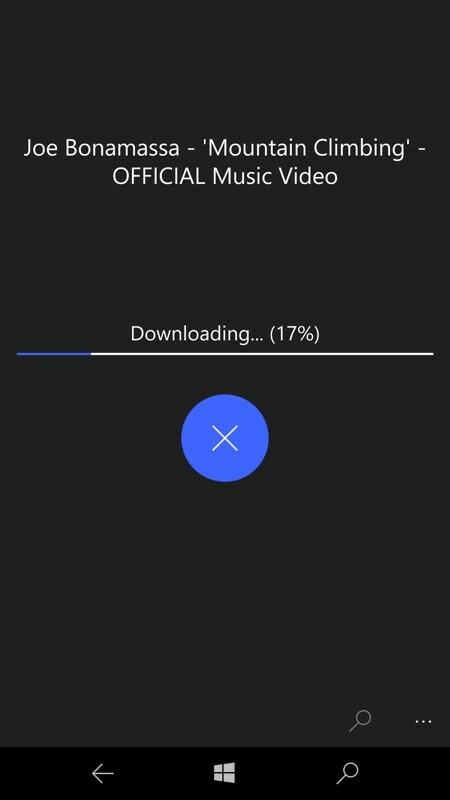 Eventually, though, the song will be downloaded as a .M4A (MPEG 4 audio, as spat out by iTunes and similar on the desktop, and fully compatible with Windows 10 Mobile) at a maximum bit rate of 128kbps - this would be borderline quality for 'old' MP3, but is perfectly good enough for MPEG 4 audio and is probably more limited in quality by being 'just' the audio track for a video, which means that a lot of the production and original bitrate will have been focussed on the video side of things - which you're not getting. 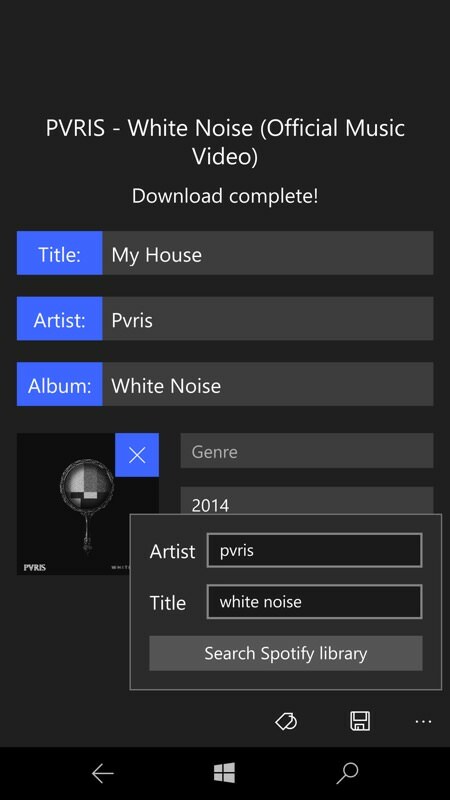 With your chosen music file downloaded, you're presented with all the meta-data embedded in the song file's header. This is pre-filled with likely candidates from the YouTube video title, though the extraction process here doesn't always get it right, meaning that you'll want to edit this yourself - again, it's a manual and possibly time consuming process. 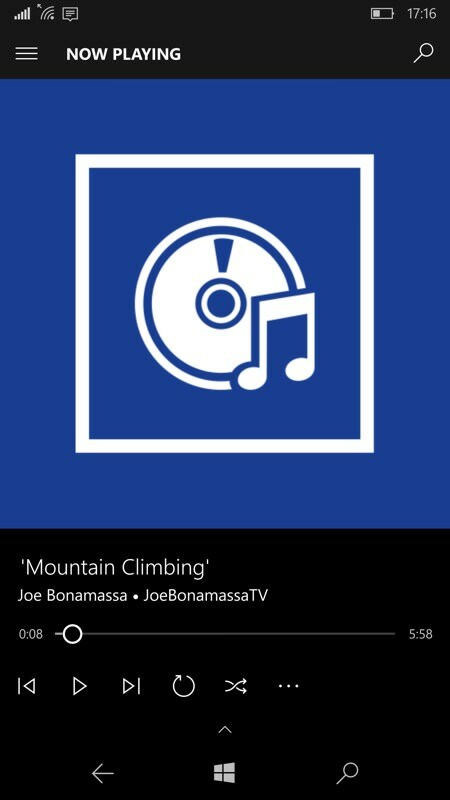 You can pick album art from local images if you want, though it's probably worth using the solitary in-app-purchase to upgrade to YouTunes! 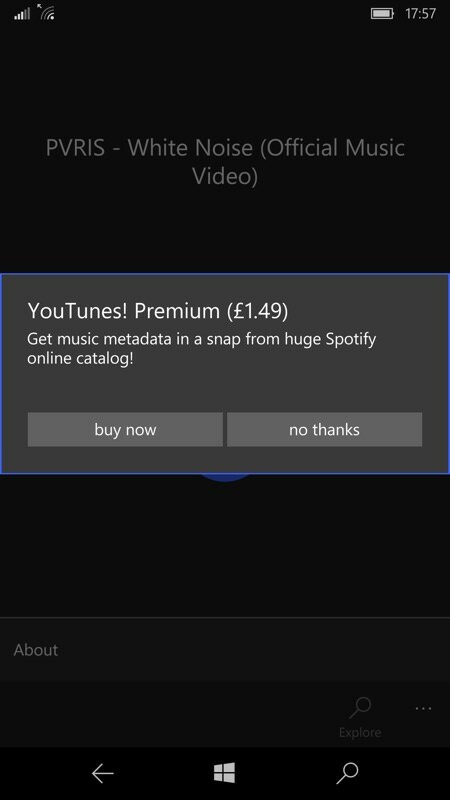 Premium, which gets you hooks into Spotify's APIs and database. At the moment, tapping on the 'Search' control brings up empty search boxes for Spotify - I'd have liked to have seen YouTunes! at least try to pre-fill these, to save typing, and this is apparently being worked on for a future version. The Spotify is usually fruitful, supplying the correct artwork for the track though also (in my tests) sometimes screwing up the track title at the same time and thus requiring additional tweaking. The culprit is, apparently, that Spotify often returns playlist matches and not just song matches. Anyway, after all of the above you'll have the track downloaded, the meta data filled in and the album art present and correct, you can tap on the 'Save' control - this writes the .m4a file to the 'Music' folder on your phone's internal disk. 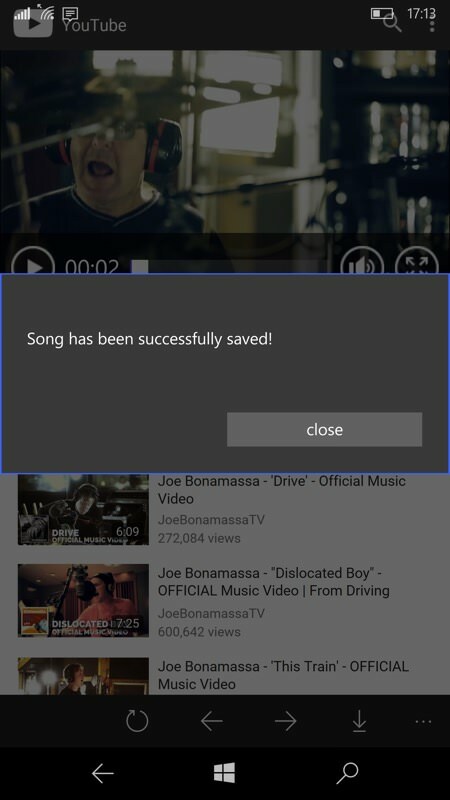 From there, if space is tight, you could move it with File Explorer, though an option in YouTunes! to use a microSD in the first place would have been nice. 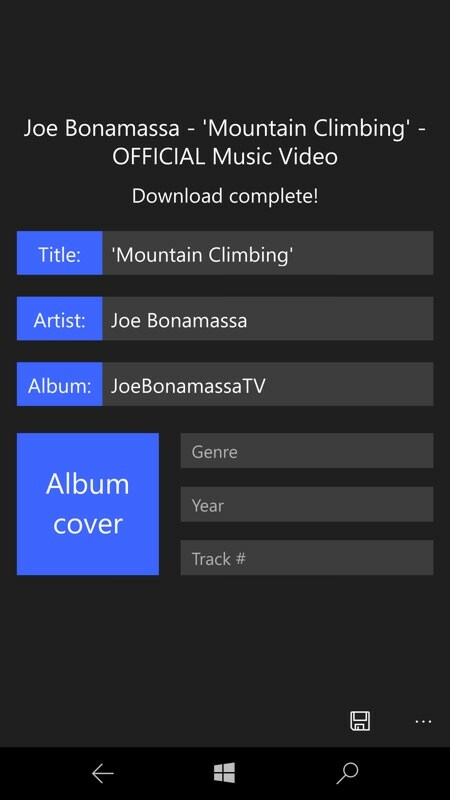 When you next open up Groove Music (or your other favourite music player on Windows 10), the new tracks will be automatically added and you can enjoy them in the usual way. The steps above sound somewhat laboursome and, again, they would be if you wanted to download all the tracks from an album, for example. But it's only a couple of minutes extra work per song, so is fine for ad-hoc use. Well, fine aside from breaking the YouTube terms and conditions that you implicitly agreed to by using the site. Which means we can't possibly officially endorse rippers like this... We just thought you'd like to know of YouTunes! existence and how well (or not) it works. Filed: Home > Reviews > YouTunes!